Pre Designed Invitations in a mini size within a mini budget. The Rita Alexis Design (RAD) Wedding Minivite Collection is here to help those brides who want to have that unique look, but not necessarily have to pay the full custom fee nor spend the months creating that perfect suite (although, she’d love to!) The RAD collection is a set of pre-designed wedding suites that are smaller than the traditional invite (simply cute as a button!) and are used in unison with your website to give your guests a full experience (no extra return envelope nor postage needed!). They aren’t your run-of-the-mill traditional designs, although some lean that way. Pricing is a bit friendlier and we will work alongside one another to semi customize your suite to represent you and your love. You and your sweet fiancé have a love so unique, capturing your perfect aesthetic is thrilling to dream about! 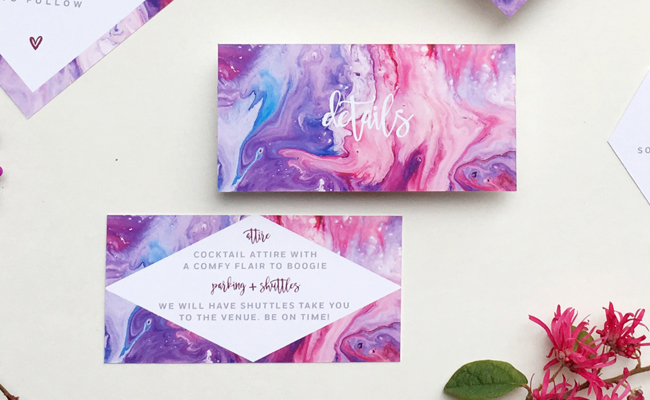 When searching for the perfect wedding stationery set, the options are endless, yet you can’t find the one that speaks to you because you tend to be a little more “unique” than the other traditional brides, and want your day to be the perfect representation of you and your love… but you can’t exactly design the whole suite yourself… and maybe your budget isn’t as lofty to include a totally custom suite. The RAD collection is a set of pre-designed wedding suites that are smaller than the traditional invite (simply cute as a button!) and are used in unison with your website to give your guests a full experience (no extra return envelope nor postage needed!). They aren’t your run-of-the-mill traditional designs, although some lean that way. Pricing is a bit friendlier and we will work alongside one another to semi customize your suite to represent you and your love. Want to start your wedding suite of your dreams right now? Below you'll find a short introduction to each of the suites. Click on respective button to see more photos and read more details. Enjoy! For the couple who want to stay on the traditional route, but change it up a bit! This is the perfect mix. You’ll have your romantic and delicate floral aesthetic, coupled with the minivite sizing, it’s surely bound to make your guests swoon. Take a look for yourself! Click the button below. For the bride who wants a sweet clean mini suite, with a touch of floral foliage. This suite is unique in its packaging as all detail cards are business-card size and are warmfully carried in a mini-sized envelope. For the bride who is a mix of whimsical and a touch of exotic style, the Ravenna is your suite. With an effortless blend of flowing marble texture coupled with the unconventional shapes of the suite, in a mini size, of course; this the Ravenna is begging to be RSVP’d to! For the bride who isn’t afraid of bold colors that make a magical statement. This painterly suite with bright hues matched with the bold sleek black will make your guests “ooOoo” and “aahhh” at what your perfect day will be like! It’s clear that you’re not the sweet foliage or whimsical kinda bride. Your love is a unique one. A bit edgy, some might say. 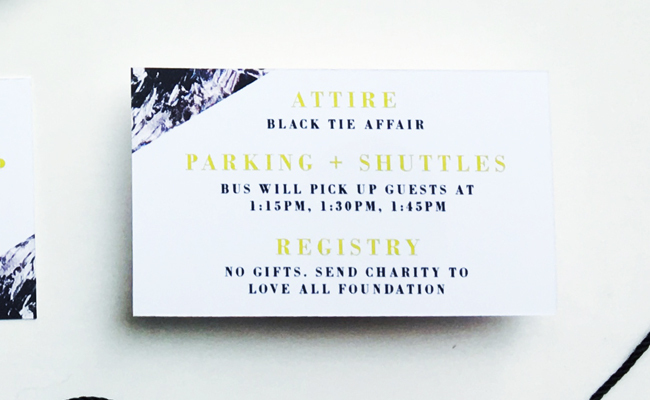 With a black and white pattern, coupled with a pop of color, and having all your details captured in a mini envelope, edgy bride, this suite is totally you. You're given 100. If you need more, I can definitely send a new estimate with the addition of what you need. They are smaller than your average invite. They are around 3.5x5.5 in size (versus the 7x5 of the traditional invite). And since they are mini–hence MINIvites. It means it is matte–so no glossy shine here! Digital is the printing process. It is printed on a digital printer (kind of like when you get your pictures printed). After designing custom suites for amazing brides, I noticed that I couldn’t reach some brides that wanted a custom look, but couldn’t afford it. Being that I always want to help everyone with design and planning, since those talents happen to be my bread+butter, I thought why not design a collection that can help these brides-to-be? My goal was to have a budget-friendly collection that was a little different here and there. Nothing totally out of left field (although, there are some that are sitting in my computer waiting to be used) A little different in size. A little different in shapes. Slightly unique designs to challenge the “wedding” status quo. And I wanted to offer it to you ladies with the help of ME–and not a program that changes your colors out for you. You see, planning a wedding is tough. I know. You hire these wedding professionals not only because we all want you to have a perfectly amazing day, but also because we use our experience and talent to make that happen so you can actually enjoy the short (or long) amount of engagement time. All that being said, it is an investment–albeit small, but what you’re getting in return is 10fold! An affordable wedding suite that represents your love. A wedding suite that isn’t like any of your friends, cousins, or siblings (design, size, guest experience). An experience with the help and guidance of an experienced and talented designer. Now click out of Pinterest, and let’s get started on your wedding invitation suite! Well, my dear, I have you covered. Custom is actually my specialty! Please visit my Custom Wedding Design Page here and let's get started on your one-of-kind invitation suite! Head on over to my FAQ page. It breaks down details, process, turnaround time, timelines, customization, add-ons, and upgrades. If you still have questions, please do not hesitate to email me at hello@ritaalexisdesign.com.